Address The Venetian, Macau. Collect Ticket in advance at Beng Seng Travel - Counter 310-312, Shun Tak Centre, 200 Connaught Road, Central, Hong Kong. Collection Information Ticket must be purchased at Beng Seng Travel - Counter 310-312, Shun Tak Centre, 200 Connaught Road, Central, Hong Kong. 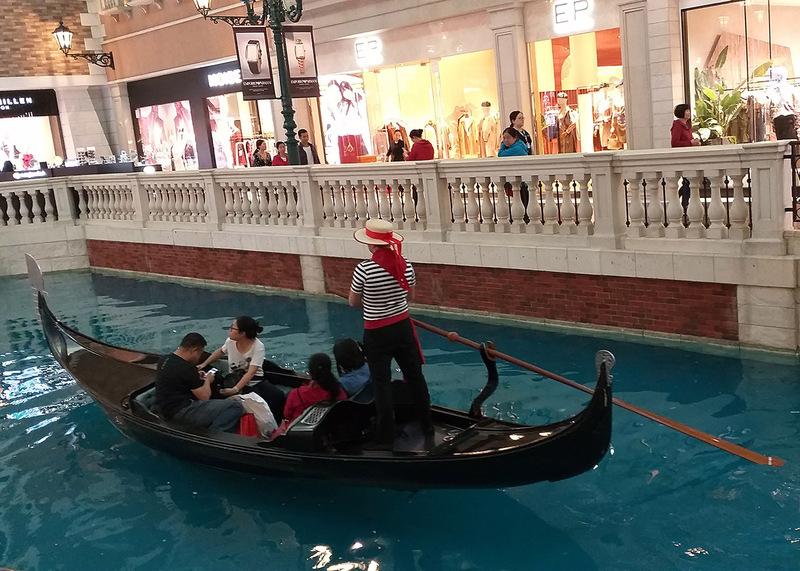 A gondolier will serenade you during your romantic ride through the San Luca, Marco Polo or Grand Canals of Shoppes at the Venetian. The gondola is a traditional, flat-bottomed Venetian rowing boat. It is similar to a canoe, except it is narrower. For centuries, the gondola was the chief means of transportation and most common watercraft within Venice. In modern times, the iconic boats still do have a role in public transport in the city, serving as traghetti (Ferries) over the Grand Canal. Their primary role today, however, is to carry tourists on rides at fixed rates. It is estimated there were 8 to 10 thousand gondolas during the 17th and 18th century. There are just over 400 in active service today, virtually all of them used for hire by tourists.